What Is The Reward Of The Saved? What we allow ourselves to think will eventually determine whether we enter God's Kingdom! How familiar are we with our thoughts and how they affect our lives? As a man thinks in his heart, so is he, says God's Word (Prov. 23:7). Here God reveals a fundamental law by which our minds work. We are, in essence, the sum total of what our thoughts make us. What we allow ourselves to think and believe is extremely important, because our thoughts are the building blocks from which all our ideas, imaginations, habits and ultimate character are formed. Our actions are always preceded by thoughts. Man has always followed after his own thoughts and beliefs. God said the people of ancient Israel walked "after their own thoughts" (Isa. 65:2). In the time of Israel's judges, "every man did that which was right in his own eyes" (Judg. 21:25). In short, man reacts to and performs the thoughts he believes in. It makes no difference whether the thought is right or wrong. We are able to choose the thoughts we wish to believe in and act on. And therein lies the cause of every evil from which this world suffers! Man, a mortal being with a physical, chemical existence, can receive physical knowledge only. Man receives this knowledge through the senses of sight, hearing, smell, taste and touch. But man's problems are spiritual! He needs to know how to have proper relationships with both God and fellowman — and those areas are spiritual. Yes, man is made in God's image (Gen. 1:27). God gave man a spirit that imparts the powers of intellect and reason — the element that raises man above the level of animals to the God plane — the element that makes him like God (Job 32:8). But man's mind is incomplete. To understand and deal with spiritual things, man's mind must have imparted to it God's Holy Spirit — the mind, motivation and attitude of God. 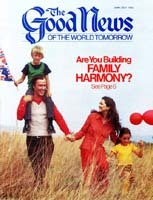 The first humans, as Pastor General Herbert W. Armstrong has explained, had the chance to receive the Holy Spirit, but rejected the opportunity. God then shut off the Holy Spirit from man, except those God would call for special purposes during the first 6,000 years of a 7,000-year plan. And that is the state in which man finds himself now! His mind is utterly incapable of discerning right from wrong without God's Spirit, and thus he finds himself constantly in trouble because of his thoughts, his motivations, his conflicts with other people and his inability to have a right relationship with God. For more information on this vital subject, request a copy of Mr. Armstrong's newest booklet, Never Before Understood — Why Humanity Cannot Solve Its Evils. It's absolutely free. We in God's Church, who have God's Holy Spirit, are to be learning to judge properly between right and wrong, and to choose the right. And that means learning to control our thoughts, from which our actions spring. In short, God has called us to learn to think, feel, say and act as He does — to develop His thoughts, emotions, character and mind. Christ said, "Be ye therefore perfect, even as your Father which is in heaven is perfect" (Matt. 5:48). Paul said, "Let this mind be in you, which was also in Christ Jesus" (Phil. 2:5). The loving mind, thoughts and ways of God are found in print in the Bible. The Bible was designed to guide us in building the kind of mind God has. Our job requires that we become experts at recognizing and rejecting all that is not godlike in our thinking. Every thought we think is either oriented toward God's loving way of thinking or Satan's selfish way. God's thoughts are always positive and motivated by outgoing concern. Satan's thoughts are negative, though they may seem positive: Consider, for instance, the "pull yourself up by your own bootstraps" philosophy based on vanity and self-exaltation. All satanic thoughts are based upon selfish motives and produce nothing but vanity, heartache and foolishness. God's Word says, "The thought of foolishness is sin" (Prov. 24:9). So all thoughts motivated out of selfishness are foolishness and therefore sinful! How many of us are robbing ourselves of spiritual growth, health and happiness by allowing our minds to indulge in foolish ways of thinking each day? God has called us to learn to think... as He does — to develop His... emotions, character and mind... Paul said, "Let this mind be in you, which was also in Christ Jesus" (Phil. 2:5). Foolish thoughts come from within and without. Those from without come from Satan and his world. "The prince of the power of the air" (Eph. 2:2) saturates the world with his selfish attitude. Some prime vehicles through which Satan disseminates his ways of thinking are radio, television, movies and the printed media; we need to be selective in how we use these media. Even our friends and relatives can be used to introduce foolish thoughts into our minds. We must not allow the world's satanic ways to be poured, unchallenged and unabated, into our minds. Foolish thoughts may also come from within. Daydreaming can, for instance, waste valuable time. To escape reality, many squander their time indulging in useless, selfish fantasies, or by wishing things in the past or present were different, or by daydreaming of a better tomorrow. Our fleshly desires can also affect our thoughts. Wrongly manifested, our desires provoke thoughts of "adultery, fornication, uncleanness, lasciviousness" and every other wrong, self-serving lust of man (Gal. 5:19). Many allow material desires to rise above godly desires. Some consume their time and thoughts with the foolish misuse of their emotions. Fear, worry, doubt, anger, hate and other powerful emotions are good only if they produce something worthwhile in our lives. For instance, if we worry, we should worry about whether we are pleasing God; if we hate, our hatred should be directed toward sin. Otherwise, such emotions may be vain, foolish and sinful. How, then, may we rid ourselves of wrong thoughts and develop God's mind and way of thinking? Following are four steps. In English, they all begin with an r.
The first r is to recognize our wrong thoughts. Just as we find it easier to see the "mote" lodged in someone else's eye than the "beam" in our own (Matt. 7:3), it is often easier to see our misdeeds than it is to see our ways of thinking that caused them. Recognizing our improper thinking is the most difficult part in overcoming our problems, but we will not be able to overcome our problems until we do. We need to deeply study God's Word and begin to think as God thinks — begin to see as wrong what God sees as wrong. When we do, half the battle is won. Next we must repent of wrong thinking, however it may be manifested in our emotions or habits, each and every time we recognize it. Peter told Simon Magus to "Repent therefore of this thy wickedness, and pray God, if perhaps the thought of thine heart may be forgiven thee" (Acts 8:22). In order to eradicate our foolish thoughts, we must recognize them for the sins they are and repent of them on the spot, praying to God for forgiveness. And we must do so every time the sinful thought occurs, be it once or 1,000 times a day. Isaiah said, "Let the wicked forsake his way, and the unrighteous man his thoughts: and let him return unto the Lord" (Isa. 55:7). Once we have recognized and repented of our evil thoughts, then we must turn to God and allow Him to give us the right thoughts we should think. The next r is that we replace our sinful thoughts with God's righteous thoughts. God made our minds to react to — to actually become — what we think about all day long. That is why God told Joshua: "This book of the law shall not depart but of thy mouth; but thou shalt meditate therein day and night, [why?] that thou mayest observe to do according to all that is written therein" (Josh. 1:8). King David also knew the importance of filling his mind with the Word of God. He said: "O how love I thy law! it is my meditation all the day" (Ps. 119:97). The way to get rid of the wrong is to replace it with the right. Even after we have replaced the wrong thoughts with the right ones, the battle is not over. Satan will strive to inject wrong thoughts back into our minds. Bad thoughts, emotions or habits tend to return again and again. This brings us to the vital last r.
When the sinful thought returns, we must resist it and repeat the first three rs again. If we are persistent in applying these four steps every time the wrong thoughts, emotions or habits occur, they will have less and less of an effect on our lives, until one day they will be gone. In short, we must learn to develop God's way of thinking, growing toward "a perfect man, unto the measure of the stature of the fulness of Christ" (Eph. 4:13), which is our God-intended destiny!